Why parents choose Splash Math for their fifth graders? Having worked with decimal places up to hundredths, fifth graders are now ready to graduate to the thousandth place value. Children no longer have to rely on old decimal names worksheets. 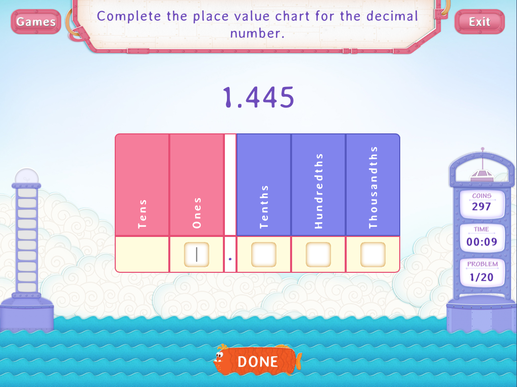 This fun and interactive game helps them recap what they already learned about decimal place value in previous grades and introduces them to the third decimal place. - Begin by identifying the digits corresponding to different decimal place values and then identify the place values corresponding to the underlined digits in a number. - Move on to colorful place value charts associating digits with the corresponding place values visually. From measuring a piece of cloth to counting how many cents to expect when exchanging a $1 bill for a 75-cent item, decimals help us get through the day. Now that children can identify decimal place values up to the thousandth place or up to three (3) decimal places, they can learn to express decimal numbers up to thousandths in their expanded forms and on a number line. 5.NBT.1Recognize that in a multi-digit number, a digit in one place represents 10 times as much as it represents in the place to its right and 1/10 of what it represents in the place to its left.